Click here if you would like to print out and mail your registration. Click on our Current Class Schedule for pricing and times of classes. Have you always desired to knit but unsure of what knitting class would be right for you? At The Knit With, the Crash Course teaches you all the basics and in just three weeks. Learn to cast on, knit, purl, identify your stitches, add new balls of yarn, and bind off. With your Crash Course skills, you will be able to complete a scarf, an envelope purse, a pillow, an afghan ? an unlimited array of items based upon the square or rectangle shape; allow your imagination to explore the creative possibilities achieved with two needles and one stand of yarn. Ideal class for those who yearn to learn to knit. Pre-requisites: A desire to Knit. Duration: Four sessions of one hour. Materials: Materials List provided upon registration. Registration Limits: Six participants each class. Knitting is a timeles hand craft that isn't reserved just for adults! Knitters who learn the craft as children possess a handcraft to be enjoyed for a lifetime. Knitting isn't just for girls either....many boys knit as well!! This class teaches the "basics" of knitting: How to cast on, knit, join new yarn, and to bind off your first knitted item! Ideal class for children who yearn to learn to knit. Pre-requisites: A desire to Knit between the ages of 8 and 14 years old. Duration: Three sessions of one hour. Registration Limits: Four participants each class. Knowing the basics just doesn't satisfy the beginning knitter! Ideal for the beginning knitter who wants to expand past scarf projects, but is not yet ready to take on the introduction to accomplished knitting, this class helps you hone your basic skills and learn to increase and two ways to decrease. Experience the wide world of color, practice how to's to give your garment a fit tailored for you using a pattern that gives your garment the extra touch of you! Pre-requisites: Beginning Knitting: A Crash Course or equivalent knowledge. This class series ? going way beyond knit and purl ? teaches you all the skills used by accomplished knitters: increases, decreases, yarn-overs, following pattern stitches, reading both printed and knitted knitting while making a classic English waistcoat. Ideal next class for graduates of Beginning Knitting: A Crash Course. Duration: Six sessions of two hours. Registration Limits: Eight participants each class. Introductory knitting, the accomplishment of a vest suitable for business attire, is designed to introduce beginning knitters to successful, independent knitting. The American style of holding the needles and the yarn is employed. achieving gauge; two different methods for both increasing & decreasing stitches; cast-off and bind-off. As importantly, Introductory knitters are exposed to the reading of knitting -- both printed instructions and knitting stitches as they appear on the needle or in the completed fabric ? as an integral component of this course. Throughout the duration of this Class, concepts in adjusting prepared patterns to fit varying individual gauges and adjusting patterns to fit are discussed. The variance between American and Continental knitting, as well as left-handed knitting are also discussed. Other topics discussed in detail include: fibre identification, fibre differentiation and fibre selection; yarn twists and weights (not all yarns are the same); needle sizing and selection; tension sampling and the necessity for accurate body measurement. Suggestions for yarn selection are offered; the yarns available for participants are as wide-ranging as are the personalities of the class participants. Tuition for Introductory Knitting does not include the cost of materials or instruments. Instructors of Introductory Knitting may vary and all are experienced knitters and experienced adult educators drawn from The Knit With staff and friends; Introductory Knitting meets for six consecutive weeks with each session scheduled for 2 hours. mitering garment edges; successfully removing waste yarn; spacing buttons and buttonholes; weaving in yarn ends. Participation in Part Two is limited to knitters who have taken Part One and who have completed (or nearly completed) their vest of three pieces. Participants should not need to purchase any new materials or instruments. Introductory Knitting--Part Two is not a comprehensive workshop in finishing techniques but is an introduction to a limited set of finishing skills and finishing techniques. Introductory Knitting--Part Two meets for six consecutive weeks with each session scheduled for 2 hours. Missed sessions may be made up by appointment only. Instructors of Introductory Knitting--Part Two may vary; all instructors are experienced knitters and experienced adult educators drawn from The Knit With staff and friends. This Class is geared to transforming introductory knitters into fully independent and versatile knitters -- those who are adept in using the variety of needles available to handknitters and creating the myriad of shapes handknitters use to fashion sophisticated, or funky, pieces of wearable art. working short rows; joining knitting fabrics; dividing knitted fabric for specialty shapes; picking up stitches in pattern; knitting without the necessity of seaming finished pieces but creating the appearance of seams. Participants will review various methods of increasing, decreasing, casting off, binding off and casting on stitches. Throughout the duration of this Class, concepts in adjusting prepared patterns to fit varying individual gauges and adjusting patterns to fit varying sizes are discussed as are the concepts necessary for substituting stitches without the need to alter the garment pattern and the necessity for accurate body measurement. Participants in The Versatile Knitter are expected to possess the skills set taught in Part One of Introductory Knitting--Part One, although they may have yet to complete Part Two.Tuition does not include the cost of materials or instruments but does include the garment pattern. Handouts are provided. The Versatile Knitter meets for six consecutive weeks with each session scheduled for 2 hours. Missed sessions may be made up by appointment only. Instructors for The Versatile Knitter may vary; all are experienced knitters and experienced adult educators drawn from The Knit With staff and friends. The project oriented Intermediate Knitting class concentrates on intarsia, combining different yarns of multiple colors or textures in either geometric (but not stripes! ), abstract or pictorial patterns. Intermediate Knitting reviews basic knitting techniques, gauging yarns and needles, body measuring and tension sampling. Participants elect the garment and design to be worked from the wide range of intarsia patterns available in the shop from noted knitwear designers such as Debbie Bliss, Alice Starmore, Sasha Kagan, Susan Duckworth, Jenny Kee, Patricia Roberts among many others. 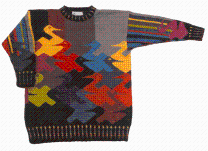 Or participants can use a favorite pattern requiring the intarsia technique. Suggestions for yarn selection are offered; the yarns available for participants is as wide-ranging as are the personalities of the class participants. Suggestions for design selection are also offered with participants electing to work on the garment of their choice. Intermediate Knitting meets for six (6) consecutive weeks with each class session scheduled for 2 hours. Tuition does not include the cost of materials or instruments. The course leader is drawn from the experienced and knowledgeable knitters on The Knit With staff. Cables--sophisticated and sublime--is the focus of Part Two of Intermediate Knitting which is an alternative series of instruction to intarsia knitting. In Part Two, participants are introduced to the techniques, challenges and joys of stitch patternwork while knitting the pieces of a woman's v-neck cardigan; completion of the garment is at each knitter's own pace and completion within the course period is not expected although homework is required. to read charted knitting using the simplified European method of charting stitches; to execute simple and complex right and left directional twists; techniques for working with multiple stitch patterns; the importance of gauging rows when working multiple stitch patterns; achieving uniform gauge while using stitches with varying dimensions; maintaining patternwork while decreasing for shape. Intermediate knitters are exposed to the various methods of reading cabled knitting--row by row, American and European charted instructions as well as pictorial instructions--as an integral component of this course. Throughout the duration of this Class, concepts in adjusting prepared patterns to fit varying individual gauges and adjusting patterns to fit are discussed as are the concepts necessary for substituting stitches without the need to alter the garment pattern. Other topics discussed in detail include: fibre differentiation and fibre selection; how yarn twist enhances cabling; needle sizing and selection; tension sampling and the necessity for accurate body measurement. Participants in Part Two are not required to have completed Part One (Intarsia) as the two parts of Intermediate Knitting are complementary and alternative courses but are expected to possess the skills set taught in Introductory Knitting. Tuition does not include the cost of materials or instruments. 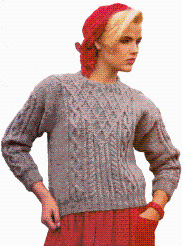 The sweater pattern and multiple stitch charts are provided as is a key to reading simplified charted stitch patterns. Intermediate Knitting--Part Two meets for six consecutive weeks with each session scheduled for 2 hours. Missed sessions may be made up by appointment only. Instructors of Intermediate Knitting--Part Two may vary; all are experienced knitters and experienced adult educators drawn from The Knit With staff and friends. Knit a different way ? from the top-down and in the round. The raglan for this class introduces you to knitting in the round ( say good-bye, purl! ) and practices a variety of increasing methods. Choose a cardigan or pullover. Top down knitting has added bonuses: try the garment on as you go and wear it right off the needles. Advanced Knitting is designed for yarn-enthusiasts who have mastered the skills sets presented in Introductory and Intermediate Knitting and delves into such specialized skills as knitting on the bias, knitting in the whole (invisible cast-on), and combining complex stitch patterns either alone or with intarsia. The project oriented Advanced Knitting class quickly reviews basic knitting techniques, gauging yarns and needles, body measuring, tension sampling and intarsia technique. Participants elect the garment and design to be worked from the wide range of patterns available in the shop from noted knitwear designers. Suggestions for project and yarn selection are offered with the yarns available as wide-ranging as are the personalities of the class participants. Advanced Knitting meets for six (6) consecutive weeks with each class session lasting 2 hours. Tuition does not include the cost of materials or instruments. The course leader is drawn from the knowledgeable and experienced knitters on The Knit With staff. Are your fingers just itching to knit but your mind says your skills feel, or are, too rusty to do more than dream of executing the shapings necessary for something other than a straight scarf? An easy and fun way to regain or restore your knitting skills to an accomplished level is taking The Knitting Skills Brush-Up Workshop. The Knitting Skills Brush-Up Workshop is an ideal venue for busy returning knitters --who want to delay no more knitting like the expert they once were! --to return to the craft they love and enjoy. The Knitting Skills Brush-Up Workshop reviews all the foundational techniques employed by accomplished knitters: cast-on, knit, purl, slipping stitches, increasing and decreasing, changing needle sizes and stitch patterns and both cast-off and bind-off. The project for this Workshop allows returning knitters to practice at least three distinct knitting stitches while accomplishing a pass-through neck stole which can be knit in a variety of yarns -- textured or variegated, smooth-finished or brushed -- and suitable for wear at any time of the year! This Workshop is designed to allow the just returning knitter to complete this project during the Workshop hours. Hurray, no homework! Attendance in The Knitting Skills Brush-Up Workshop is limited to 10 participants and meets for four (4) sessions over four (4) consecutive weeks. Previous knitting experience and prior knowledge of knit and purl is required. Tuition does not include the cost of yarn and other materials. Knitting socks is a great way to graduate from scarfs into more substantial knitting. This workshop, with minimal homework, ravels the mysteries in knitting socks in four weekly sessions of two hours each. Learn to work short rows, practice picking up stitches, turn a heel and perfect Kitchener Stitch, a unique way of simultaneously binding off two pieces of knitting. Choose your hose from a funky self-patterning yarn or classic heathers. Tuition does not include the cost of materials. Workshop leaders are experienced knitters drawn from The Knit With's staff and friends. These single session workshops allow knitters to learn new skills while accomplishing a completed project within the workshop timeframe ( yippee, no homework!). Make & Take Workshops have a hands-on focus to develop a knitter?s ability to perform an unusual technique or unusual combination of a series of techniques while making a desirable and usable knitted object allowing for practice of the techniques discussed and demonstrated. The cost for each Make & Take Workshop includes tuition, all necessary yarns and all necessary patterns or other printed matter to accomplish the Workshop project; registered participants are notified in advance of the meeting date of any instruments or accessories to be brought to the Workshop. Most Make & Take Workshops meet for two hours and have registrations limits; all pre-requisites necessary for an individual topical workshop are listed under the individual topical descriptions. Attendance at all Make & Take Workshops is by advance registration only; missed workshops can not be made up. Use straight needles and multiple lines of knitting to make the circle of a tailored knitted yarmulka. Unlike patterns modeled on the African kufi to knit a Sephardic style kippa or crocheted yarmulkas, knitted yarmulkas wear properly without pins and without sliding?using knitting?s intrinsic properties to stay in place. This Workshop introduces and practices the techniques necessary to turn a series of straight lines into the circular shape of a yarmulka?techniques which can be elusive to even the best knitter. Attendance is limited to 6 participants who are expected to possess knitting knowledge and skill equivalent to completion of the shop?s Interm ediate Knitting classes. Knitted Yarmulkas meets for two hours. Learn to knit to fit, whether you need to upsize or downsize your pattern. Altering patterns to the size and the fit you want to knit is fun, rewarding and freeing. 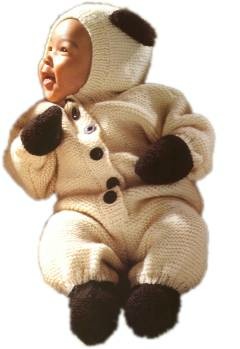 We?ll convert a child?s kimono pattern to adult sizes. If you have a particular figure challenge, we?ll try to address it. The mitred square playfully creates knitted fabric one square at a time. When using odd bits of similarly weighted yarns, you can clean out your knitting basket with this technique which can de used for any garment style. Duration: Three sessions of two hours. The Professional Finishing Workshop explores, hands-on, the specialized finishing techniques which distinguish hand-knits from the simply homemade. It is an ideal workshop for the dedicated knitter who aspires to be the complete craftswoman and sole author of her knitting. Pre-requisites for attendance are: Knowledge of knitting equivalent to Intermediate Knitting, knowledge of crochet equivalent to Introductory Crochet and four garments, ideally of different styles (i.e., not all raglans ) ready for finishing. Professional Finishing meets for 3 sessions of two hours each. Attendance is limited to 8 participants; tuition does not include the cost of materials or recommended readings. There are no required readings for Professional Finishing; recommended readings are: The Handknitters Handbook and Decorative Crocheted Borders. Specialized techniques covered in this Workshop are: 3 needle bind-offs; invisible seaming; slip stitch seaming; the proper technique for seam weaving (varies according to the garment style); Kitchener and mock Kitchener stitches; seamlessly adjusting increases and decreases; continuous border attachment; mitered borders; crocheted borders; puffed, crinkled and flat set-in sleeving; hemming and invisible hemming; blocking and finishing without the need for blocking; invisibly picking up stitches for collar and border knitting and attachment; and decorative crocheted borders. knitters into truly independent, self-sufficient and facile knitters by focusing, in-depth, on the skills which distinguish accomplished knitters from those whose knitting know-how extends to simply making knits and purls. Each workshop treats a single aspect of understanding the universal vocabulary of knitting -- one word at a time. Workshop sessions meet for no more than two hours and provide opportunities for hands-on practice of the concepts and techniques discussed and demonstrated; certain sessions are structured primarily to impart knowledge. Participants may register for individual workshops only or on an as-needed basis. Attendance is limited to 10 participants in each workshop. Advance registration is required; missed workshops can not be made up. Participants registering for the entire series of workshops receive a 10% discount when registering for the entire series at once. The Accomplished Knitter series of workshops is designed for beginning knitters who have completed the shop's Introductory Knitting class, or its equivalent, and builds on the skills introduced there. This workshop series is not designed as a substitute for the Introductory Knitting class and requires participants to be facile in the making of stitches as either knits or purls, having a working knowledge of reading knitting and be familiar with basic knitting techniques; concurrent registration with the Introductory Knitting class is not recommended. Become a truly independent knitter by understanding how to read and understand printed knitting. In this session, we talk you through the basics of pattern reading: how patterns are structured, what they should be telling you and why reading today's patterns, however baneful, is infinitely more informative than reading the patterns of yore. This workshop allows you to come to grips with learning the whole new and universal language of knitting -- and a language of abbreviations at that! The workshop explores, hands-on, the common, basic as well as perhaps slightly more advanced, knitting techniques which most often appear as unexplained, or improperly explained, abbreviations in both basic, designer and fashion knitting patterns. Handouts and class exercise yarn are provided. Participants are requested to bring to the class one pair of No. 6 needles, as well as their knitting notebook and a pen. Time permitting, the class will explore the reading of historical knitting patterns. Unlock the mystery of reading yarn labels: all those little, undefined symbols which spinners use to communicate yarn properties but seem never to be explained anywhere and seldom understood or used by pattern writers to their best advantage. In this session, we talk you through the meanings of universal yarn symbols, their value to you as a knitter, as well as the new system for classifying yarn weights which is now appearing in so many knitting publications and designer pattern books. A continuation workshop in the Accomplished Knitter Series to allow you to buy and use the yarn you want rather than just the yarns suggested by the pattern writer. Printed handouts provided. Participants are requested to bring to the class their knitting notebook and a pen. Time permitting, an exploration of historical yarn classification systems will be provided. Another workshop in the Accomplished Knitter Series, Session 3 focuses on achieving gauge and useful techniques in perfecting gauge. Gauge varies but achieving gauge can and does happen! Achieving gauge is a good thing -- not only is the knitting experience more pleasurable but knitting to gauge often distinguishes a comfortable, well-knit garment from those which are ill-fitting, too-warm or not warm enough as well as those which droop sloppily during wear. Printed handouts are provided as is workshop exercise yarn. Participants are requested to bring to the class one pair each of Nos. 4, 5, 6, 7, 8 and 9 needles, a flexible, non-stretching fabric tape measure as well as their knitting notebook and a pen. A continuation workshop in the Accomplished Knitter Series, Session 4 focuses on body measurements, so necessary to the fit of completed handknits. Participants will learn which body measurements are necessary for various garment styles and how certain body measurements suggest an ideal garment style (based on the fit of the garment) and how certain measurement challenges suggest the use of specialized knitting techniques. Participants will exercise the correct techniques of taking and recording body measurements so important to selecting pattern sizes and achieving both optimal fit and pleasure in wearing handknits. The concept of garment ease, and how ease affects wear and comfort, will be discussed in detail. Printed handouts are provided. Participants are requested to bring to the class a non-stretching, flexible fabric tape measure as well as their knitting notebook and a pen. By registration in this class, participants acknowledge they will be, and agree to be, measured by other class participants. Leave your inhibitions and hang-ups (but, please, not your self-esteem) behind! Avoiding the Ravels, the final workshop in the primer series for Accomplished Knitters, focuses on techniques to identify, fix, and avoid common mistakes in knitting. Become the knitter who accomplishes projects without the frustration of repeated ripping and extensive raveling of your knitting. Participants will be introduced to the visual and tactile methods of knit and purl stitch identification, will exercise mistake identification and techniques in mistake correction including the "un-knitting" technique. Participants are requested to bring to the class a Size B crochet hook and one pair of No. 6 needles. Printed handouts and exercise yarn are provided. Have you been invited to an affair, whether a wedding, society dinner or other function, and lack an appropriate handbag? Learn the techniques to create a charming, elegant evening bag to display your knitting skills and stand out from the crowd! Participants can select to execute their knitted evening bag from multiple styles of elegant evening bags, and multiple designs within each style, all designed by The Knit With's founder, Marge Casale. Appropriate for all levels of knitters who have mastered knit, purl and tension, this two session workshop is a great introduction to the specialized techniques of master knitters covered in detail in the series of Designer?s Workshops and complements the Professional Finishing Workshop. Knitted Evening Bags meets for 2 sessions; the first session is a group meeting for 2 hours and the second session is by appointment, either individually or in smaller break-out sessions, if necessary. Attendance is limited to 8 participants. The group session discusses the importance of gauge and how it relates to the various styles of elegant knitted evening bags from clutch to envelope to tear-drop purse. Specialized techniques covered include: invisible cast-on, the seamless and invisible attachment of bag handles, knitting unstretchable shoulder straps, creating invisible gussets, creating three dimensional box bags, and adapting pattern stitches to the shape of evening bags. The follow-up session covers creating and inserting the bag lining, blind stitch attachment of the lining after knitting and assembling the bag, and embellishing your bag by using vintage jewelry or unique buttons. Tuition does not include the cost of your materials. Classes and Workshops offered by The Knit With are wonderful opportunities for yarn-enthusiasts to expand their skills in the age-old techniques of the unitary construction of fabric and garment known as knitting and crochet. In addition, Classes and Workshops offered by The Knit With ? each of which is limited to no more than 12 participants to foster direct interaction with the instructor, although specific workshops may have, and often do have, lower attendance limits ? enable fibre artists to share their yarn adventures, and homework, in community with others. For those whose urge to knit is more immediate, individual instruction is available the year around by appointment. Classes are offered seasonally throughout the year at an array of progressive skill levels in both knitting and crochet. Classes are scheduled for a variety of both day and evening times although not all Classes are offered at all times nor during each seasonal series; the current seasonal series of classes for which registrations are being accepted identifies the specific Classes to be offered and the meeting time(s) for each and the tuition for each (tuition does not include the cost of yarns and instruments). Classes meet for six consecutive weeks for two hour sessions each week. The directed instruction provided during in-session Classes is planned to be supplemented by designated ?homework?. Workshops offered by The Knit With are either hands-on sessions -- where participants are expected to execute their projects primarily during the workshop sessions -- or in a modified seminar format offering opportunities for both discussion and exercise of the techniques demonstrated. Workshops may meet for less than six weeks; depending upon the subject matter, and meet for less than two hours, also depending upon the Workshop subject matter. Different Workshops may have different enrollment limits and tuition, which does not include the cost of materials or recommended readings, varies according to Workshop subject matter. Because Workshops are hands-on experiences, certain Workshop topics may have pre-requisites in skills and materials. The listing of Workshops offered in the upcoming seasonal series identifies the specific Workshop(s) offered, the meeting and duration time(s) for each, all pre-requisites which may apply as well as the appropriate tuition for each Workshop. All classes and workshops offered by The Knit With meet only at the shop location unless otherwise stated. Classes and Workshops are offered during seasonal series; not all classes and workshops are offered in each series nor are all offered at every available time. All Classes and Workshops have registration limits. Attendance in classes is limited to twelve (12) students, unless a lower attendance limit is stated for a specific Class; Workshops may have varying and different registration limits. Registration in advance of the start of a Class or Workshop is required. Attendance is limited to registered participants, i.e., there is no open attendance. Classes are project oriented, i.e., students are offered a series of instruction planned to accomplish through session work, and homework, a specific project or a project designed to lead to the accomplishment of a specific handwork skill level. Classes meet for six consecutive weeks, legal holidays excepted, at the same time and day each week. Workshops generally treat, hands-on, a broad range of techniques and skills and may have material pre-requisites as well as require an independent knowledge of specific techniques or skills not taught as part of a specific workshop, e.g., the finishing workshop requires knowledge of basic crochet and knitting in addition to availability of garments ready and suitable for finishing. Workshops may, and often do, meet for fewer sessions than Classes and each meeting session may be for shorter durations than Classes; Workshops meeting over multiple weeks begin at the same hour on the same day of each week. All Workshops and Classes are offered only on a tuition basis. Tuition should be fully paid upon registration and no later than the first session. Tuition includes the cost of any syllabus and printed materials specifically designated by the Instructor as necessary for the specific class but may not include published patterns; the prohibitions of copyright law apply to knitting patterns not in the public domain. Not all Classes or Workshops have printed materials. All Class and Workshop participants are apprised, in advance, of any required or recommended materials list. Tuition does not include the cost of yarns, needles or accessories selected by the participant although necessary for the class or workshop. A tuition surcharge may be applied where participants desire to use yarn purchased elsewhere. Class participants may withdraw, with a pro-rata refund of tuition less a one-half capitation, through the start of the third session after which no tuition refund is allowed; no refund of tuition is allowed upon withdrawal from or non-attendance at a Workshop. The Knit With reserves the right to combine sessions of Classes where no adverse affect upon the participants will be anticipated. Class participants who anticipate the need to miss a regularly scheduled Class may attend a scheduled make-up session or attend a session of another Class, provided space is available in that session and the make-up attendance would not conflict with the presentation of that Class. Class participants not able to make up missed instruction in this manner may do so during regularly scheduled store hours -- provided such make-up session is convenient with the Instructor and an appointment has been made; a missed appointment can not be further re-scheduled. Most but not all Classes include an additional make-up session which meets at the regularly scheduled time; participants who have not missed any session may attend the make-up session without further tuition charge. Additional instruction can be offered, at no additional charge, to any Class participant during regularly scheduled hours -- provided such additional instruction is convenient with the Instructor and does not conflict with the regular conduct of business. Additional instruction does not extend to subject matter not included within the Class syllabus, e.g., a Class formulated to instruct a new knitter in the execution of knitted garment pieces does not include the assembly and finishing of that garment. Missed Workshops unfortunately can not be made-up. In the event a scheduled Class or Workshop needs to be cancelled by the Instructor due to illness, emergency or required attendance elsewhere (e.g., summons for jury duty), every effort will be made to timely communicate the cancellation to all registered participants by e-mail or by telephone or public posting at The Knit With's website or by other means. Classes and Workshops cancelled in this manner will be re-scheduled at the same time and day of the next available week, legal holidays excepted. Classes and Workshops offered by The Knit With are distinctively project-oriented: the creation of a wearable garment Through limited numbers of participants, project orientation and direct interaction with the instructor, participants are able to graduate wearing their diplomas! All Classes and Workshops meet at the shop unless otherwise indicated. Advance registration is required; the enthusiasm to join a community of accomplished needle artists, while optional, can be, and often is, contagious.